When do soldiers die "in vain?" Lyndon Johnson and Richard Nixon said it about the soldiers they commanded in Vietnam. The two presidents did not want any fallen soldier in Southeast Asia to die in vain. Over the past decade of American involvement in Iraq, Afghanistan, and a variety of other Muslim countries, Presidents Bush and Obama have similarly said that every fallen soldier was valiantly serving his or her nation and had not died in vain. It may not be politically correct to ask it, but when does a soldier die in vain? I will not pretend to have a definitive answer but some situations are rather clear. 1. If a soldier dies following the conclusion of a war, that certainly is in vain. It has happened repeatedly in American history, perhaps most egregiously following the War of 1812 and the Civil War. 2. It could be argued that if a soldier dies due to friendly fire, it would be in vain. We must keep in mind that frequently there are uncertainties in alleged cases of friendly fire. Lincoln gave his speech as two regions of the United States struggled to define what America meant. Our experiment with democracy had unfinished business, namely whether it was the states or the federal government who had primary powers in this unique system of federalism. When the Civil War came to an end, it meant that the fighting ended, but the issues were not settled. They continue to this very day. Did the more than 600,000 soldiers who died in America’s Civil War die in vain? Some would argue that all deaths in war are in vain because there are better ways to settle disputes. In the case of the Civil War, it’s doubtful that any leader could have done more than Abraham Lincoln to search for peaceful ways to avoid the bloodshed. 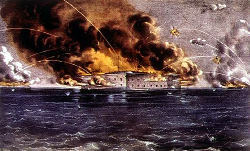 When the first shots were fired at Ft. Sumter, SC on April 12, 1861, the rules of engagement had been set and they included bloodshed. While many opposed the war as it was being fought, the prevailing views on each side were that it should be fought to a fitting conclusion. Only when the Confederate armies were either defeated or surrounded, did General Robert E. Lee sue for surrender. Did those who fought for the Union and the Confederacy die in vain? The prevailing sentiment on each side was that every soldier who died did so in support of an important cause in which he believed. To justify the deaths of the Civil War, we have to conclude two things. First, the outcome with the union remaining intact was a worthwhile resolution. Second, as a nation, we had learned lessons that would prevent us from repeating the mistakes that lead to and perpetuated the war. With varying degrees of certainty, most people would probably agree with these conclusions. The current question is whether U.S. soldiers in combat in Afghanistan and Iraq are dying in vain. It is helpful to look at the two questions we posed regarding the American Civil War and adapt them to Afghanistan. First, is the outcome of war likely to be what the United States wants? This is difficult to answer, because of the lack of clarity of the American mission. However, few people assert that even if American soldiers remain until 2014, the Taliban will not be a political force in Afghanistan and that pockets of al Qaeda will not remain. Second, will we have learned to not repeat the mistakes that plunged us into a prolonged war in Afghanistan? The answer to that lies in the future history of our country. What we do know is that in Vietnam more than 58,000 American men and women died, presumably to keep territory from falling into the hands of the Communists. Two years after the last American soldier left, all of Vietnam was under Communist rule. So the mission of preventing the spread of Communism into South Vietnam did not succeed. The second question would be did we learn lessons that would protect us from repeating our mistakes? Regrettably, it seems that American involvement in Iraq and Afghanistan would provide evidence that we did not learn that lesson. We appear to be fighting for causes that we cannot win. The problem is, as Lyndon Johnson and Richard Nixon experienced in Vietnam, no American president wants to be the first to preside over a war that the United States loses. Here are two possible solutions to the problem. First, let’s acknowledge that we lost the war in Vietnam. By any reasonable standard of measurement, we did. If we accept that, however painful it might be, then President Obama need not worry about being the first president to lose a war. If President Obama were to pull American troops out of Afghanistan and Iraq as quickly as possible, then we could better answer the questions about whether American soldiers had died in vain. First, we could say that the 58,000 American soldiers who died in Vietnam did not do so in vain. They fought valiantly, but provided us with evidence that the United States cannot win every war that it enters. As for those who have lost their lives in Iraq and Afghanistan, the same can be true. The Vietnam lesson has not been thoroughly learned, but perhaps the similarity of the outcomes in Iraq and Afghanistan to Vietnam is a necessary reminder for us to learn the lesson to not fight wars that we cannot win. If we learn that lesson now, then those who have fought and died for their country did so for a reason, though not necessarily the reason that they thought had been put in harm’s way. They died so that we could finally learn the lesson to neither enter nor remain in wars that are fruitless. It can be argued that every soldier who dies in Afghanistan and Iraq from here on out may die in vain because he or she should not have been there. Once the time to have learned the lesson passes, then there is no purpose in the death of soldiers. These are questions that must be addressed by President Barack Obama, by the United States Congress which has the power to cut off the funding for the wars, and by the American people who can tell their leaders that they will no longer accept America at war under unwinnable circumstances. It is certainly my hope, and I think that of many others, that no soldier has died in vain. But anyone who might die as a result of any delay in getting out of Iraq and Afghanistan ASAP, may die in vain. It’s a terrible thing to say, and perhaps not true. However, it is something to talk about.